Halloween seems like an appropriate time to talk about paying for retirement, because if the subject doesn’t scare the hell out of you, then you haven’t been paying attention. More than half of American workers will leave the workforce with no retirement savings and will be forced to live on Social Security benefits alone. As Paul Sullivan described in the Washington Post, that isn’t a pretty prospect. Even among the highest earners, very few have been able to accumulate enough retirement savings to maintain their standard of living after retirement. Maybe we just say that last sentence in strange ways and that’s why it doesn’t seem to soak in. Let me try it again. 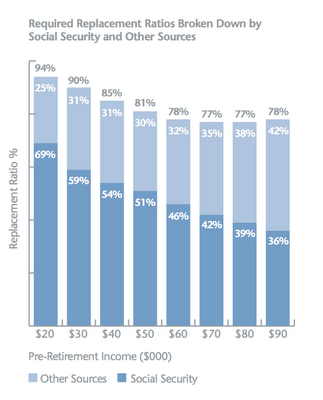 Almost everyone is going to have a lower standard of living after they retire. Almost everyone. Pretty scary, right? Sometimes, though, the things people say about retirement are scary simply because they’re so out of touch with reality. Here are a few of the scariest. I'm not worried. I’ll collect Social Security benefits. If you have paid FICA taxes for more than 40 quarters or are married to someone who did, you will be eligible for Social Security retirement benefits, but they may not be as much as you expect. The average benefit paid in 2012 is about $15,000 a year, slightly more than you would earn from a minimum wage job in most states. The portion of your pre-retirement income that will be replaced by Social Security varies by income level from about 69% for a household with $20,000 a year in income before retirement to about 36% for a household earning $90,000. And, of course, the replacement percentage continues to grow for households earning more than $90,000 a year because the maximum Social Security benefit is about $36,000 per person. The following table from an Aon Consulting study estimates the replacement percentages required. You might think that households earning more than $90,000 a year would have plenty of retirement savings, but that isn’t the case. First, higher income earners have to replace much more of their pre-retirement income from their own personal savings because of the cap on maximum Social Security benefits. Second, statistics show that only about 5% of those high-earner households have saved enough to avoid a decline in their standard of living. After Social Security benefits, the rest of your retirement income will probably have to be replaced by your 401(k) savings (the lighter blue stacks). The problem is that very few households, something on the order of 5% of them, have substantial personal savings to fill that light blue part of the gap. So, yes, most Americans will collect Social Security retirement benefits, but without hundreds of thousands of dollars of retirement savings, the benefits may not keep you in the middle class. Social Security won’t be around for me. Conservative politicians have been trying to get rid of Social Security since it was created in the 1930’s and one day they may be successful. I personally don’t think they will be for two reasons. First, the Social Security shortfall isn’t really that hard to fix if you’re willing to adjust FICA taxes just a little. Second, very few Americans have been able to save enough for retirement to stay out of the poor house even with Social Security. Maybe 5% of workers will be able to maintain their pre-retirement standard of living after retiring. Ending the program would generate a massive elderly poverty problem in this country and that is truly frightening. I haven’t saved enough money. I’ll have to work longer. Working longer is probably the most effective solution to the under-saving problem. It delays the day when you will need to start drawing down retirement savings, gives you a few years to add to those savings, and increases you Social Security benefit by delaying your claiming age. But, here’s the catch: when you retire isn’t always your choice. In a survey of recent retirees, more than half said they were forced to retire earlier than planned due to layoffs, age discrimination, health problems, the need to leave work to care for a family member and other reasons. Working longer may be in your plans, but it may not be in your employer’s even if you and your spouse are still healthy enough to work. I’ll claim Social Security benefits when I’m 62 because it takes ten years to break even if I delay claiming. Basing your finances on when you believe you will die? Is that something you feel you can predict? The problem with the break-even argument is that 1 in 4 Americans will live into their 90’s. The ones that do will live decades with reduced Social Security benefits if they claimed early. The goal of retirement planning should be to pay for your retirement if you live to be very old, not to make sure that you that you maximize benefits if you live less than your average life expectancy. Look up “regret” in the dictionary and you’ll find a picture of a widow in her 80’s in poverty because she and her husband decided to claim Social Security benefits at age 62. I’ll need to replace 70% of my income after I retire. 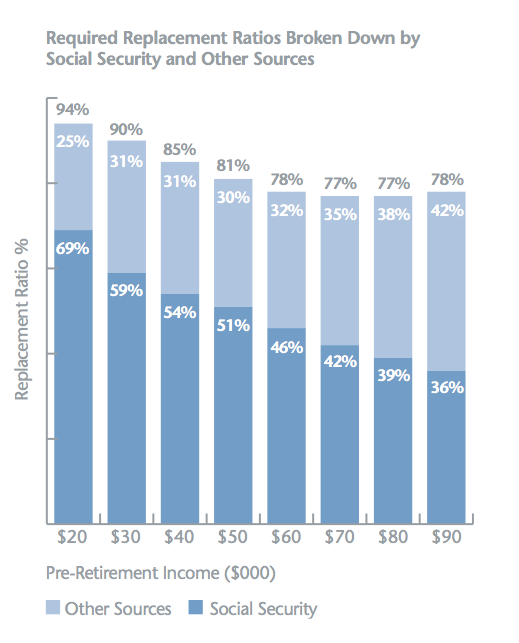 As the table above shows, most people will need to replace 78% to 94% of their pre-retirement income, depending on their income level. Medicare will cover my health insurance needs. Studies show that Medicare only replaces about 50% of all medical expenses. You’ll need to purchase a Medigap policy to cover the rest. If you decide to retire before age 65, or are forced to, you may have trouble finding a private insurer that will cover you. My average life expectancy is age 80. I need to plan for 15 years of retirement. By definition, half of retirees will live less than their average life expectancy and half will live longer. If all retirees planned on living their life expectancy, half of them would die broke. For retirement planning purposes, you need to plan on living a very long life, just in case you do. Think 95 or longer. I’m too young to worry about it. Some people like to say that “Boomers didn’t save enough”, but more than half (56 percent) of Gen X households are estimated to be at risk, according the National Retirement Risk Index (NRRI) developed by the Center for Retirement Research at Boston College. This compares with 41 percent of early Baby Boomers and 48 percent of late Boomers. Nobody has saved enough. It isn’t clear that the typical middle class household is even capable of saving that much. If you are 25 years old and plan to retire at age 65, you would need to invest about $390 a year and earn an 8% annual return to accumulate $100,000. Begin at age 35 and you would need to invest about $890 a year. Start at age 45 and you would need to invest $2,185 a year to accumulate $100,000. Paying for retirement can be a frightening proposition, but ignoring it won’t make it go away.